Olbermann's first departure from ESPN was famously rancorous as an ESPN spokeperson famously said that he didn't burn the bridges to ESPN but that he napalmed them (Olbermann once said that he didn't burn bridges, he burned rivers). Of course, he would go on to have tumultuous departures from Fox Sports, MSNBC (the second time) and Current (now currently performing as Al Jazeera America). But ESPN has said that this was a "business decision" and that they want to part with Olbermann amicably. There has been little reporting on any unhappiness on the part of Olbermann during this go-around. James Andrew Miller, as plugged-in about Bristol as anybody, reports in a must-read about how this was a different Olbermann regarding the greater-than-expected frequency of delays to his show when it was airing at 11. Interestingly enough, or shockingly enough, Olbermann took it all in stride. The old Keith would have walked off angrily, or at least threatened to, or might have gone to Defcon-1 during molten meetings with management. Not this time. Not this Olbermann. Although Olbermann didn’t really want to move to five P.M. in the first place, he took one for the team, going so far as to be paraded about at the network’s annual upfront presentation to advertisers. Olbermann did run into some trouble for sharply criticizing some Penn State students on Twitter back in February which led to him being suspended for a few days. But it appeared that this was a newer Olbermann, one with reasonable enough relations with the higher-ups. And if that were the case, why is ESPN pulling the plug? The business aspect mentioned already certainly is legitimate. There have been reports that Disney is pressuring ESPN to cut costs and just as Bill Simmons was seen as expendable given his big contract, Olbermann (who was likely getting a nice contract) was likely seen as such too considering his shows either at 11 or at five were big ratings draws. ESPN is also reportedly cutting back on production from Times Square, where Good Morning America originates, where Olbermann's show is produced (Tony Reali hosts Around the Horn from that building but the show is still produced in Washington, D.C.) and their much-publicized relocation of Mike & Mike to that building was abruptly cancelled a month later. But there also appears to be something at play here. Olbermann was a frequent and vocal critic of NFL commissioner Roger Goodell beginning with the Ray Rice fiasco. Subsequent developments regarding Rice resulted in Olbermann calling for Goodell to resign, for the league office to be cleaned out and then for Goodell to be fired. Olbermann never let his foot off the gas on Goodell over the past year and it has speculated by some that the league sought to punish ESPN for both his and Simmons' harsh criticisms by giving them a weaker Monday Night Football schedule (something that I'm not sure I buy fully). And then came a report from the Hollywood Reporter that ESPN wanted Olbermann to cease "commentary" on his show. That report was last Wednesday, followed that same day by a Deadspin report that talks between Olbermann and the network were "95 percent" dead. 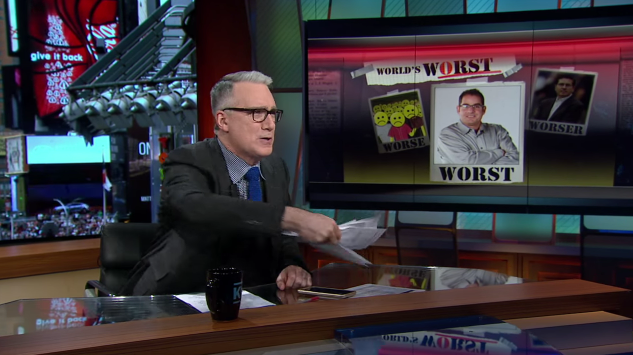 Determining what Olbermann will do next is a tough one because he has pulled some surprises before, including when he returned to ESPN two years ago. It has been speculated by some that with the coming presidential election that Olbermann may dive back into political commentary. Some are even making the obligatory MSNBC connection. Personally, I hope he stays with sports. I, for one, very much enjoyed his ESPN2 program as it was provocative and insightful without diving into the "Embrace Debate" mantra that drives some other programs at the mothership. Fox Sports 1 could use some juice (and don't forget that a key reason for Olbermann's ESPN2 show was to keep eyes away from Fox Sports Live) but it still would be a big surprise to see him back in the Murdoch realm. Olbermann is famous for being a baseball nut, could we see him landing at MLB Network? Anyways, given a career that has seen him be a lightning rod practically wherever he goes, somebody will be paying attention as to where he is headed next.